April 30, 2018 - This wall of water has broken the world record as the largest wave ever to be surfed. 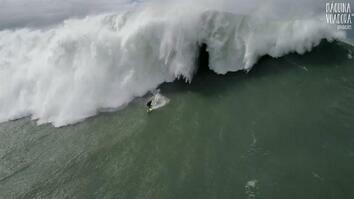 Brazilian surfer Rodrigo Koxa surfed the 80-foot wave in Nazaré, Portugal. The feat took place in November 2017 but the wave and surfer are just now being honored by the World Surf League’s Big Wave Awards. Previously, Hawaiian surfer Garrett McNamara held the record of 78 feet in 2011. The beach, named Praia do Norte, lies close to a fishing village of Nazaré and has become known for some of the largest surfing waves in the world.